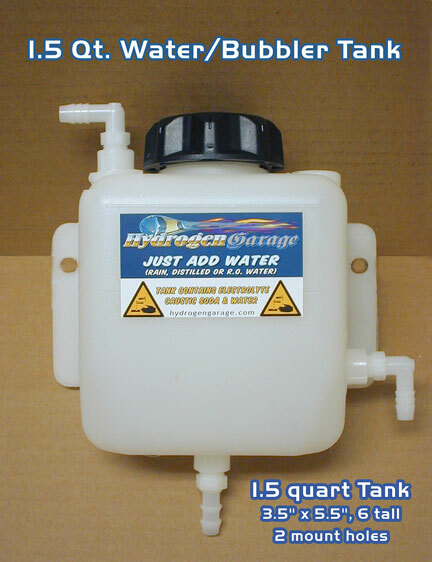 1.5 Quart Water Tank size = 3.5" x 5.5", 6" tall, 2 mount holes1.5 Quart Water Tank, lye proof plastic, we call a scrubber, where the incoming hho gas bubbles inside this tank and scrubs off the NaOH or KOH from the gas. Electrolyte/Water Re-circulating Bubbler Tank, Three sizes to choose from : 1.5 quart or 2 quart or 3 quart tank. Heavy duty clear/white lye proof, polypropylene plastic. The weakess link in any HHO cell System is the leaking tanks. We now Spin welded 1/4" NPT female fittings that do not leak! Add a straight hose fitting or a elbow, that you can turn to any direction. The water/bubbler tanks are the weakness link in a HHO Cell System. NOT GOOD. We add spin/melt 1/4" NPT female fittings onto the tank in any location. We have 5 standard hose fitting connections, but if you have a special tank configuration not listed below?, just contact us and we will make a tank just for your needs. Two choices of the CAP 1) EPA approved, 3 click, prefect seal CAP ($3.00 more) or 2) the Standard CAP, with the you feel seal. You can choose below the hose fitting locations on the tank. Each 1/4" NPT threaded fitting allows either a straight or elbow fitting, in any direction you wish. Bottom tank fitting in the center bottom of the tank. Choose either 1/4" straight or elbow or 3/8" straight fitting or elbow fitting. Also sold with 9' of clear flexible poly hose and 6 hose nylon hose clamps. Comes with lye proof teflon tape. and with 3 fittings, that you will choose below. This product was added to our catalog on Saturday 13 February, 2016.